‘Where is the Luftwaffe?’ The most common question on the lips of the landsers across the invasion front. As units struggle to get to the frontlines, Allied fighter bombers reign supreme. Two units of the recently arrived 17th SS Panzer Grenadier Division, Goetz von Berlichingen in particular have been hit hard on the main highway leading from Frougeres to Mortain. One company of the Aufklarer Batallion is down to 65% effectiveness without having fired a shot! Better news was reported by Panzer Regiment 130 of the Panzer Lehr Division. A combined attack by both its Panzer battalions gave the British 4th Armoured Brigade a very bloody nose at the village of la Belle Epine. Massed Pz IV’s and Panthers destroyed three enemy units and routed another leaving over 50 enemy vehicles burning on the field for minimal loss. And here is a little Sabaton to accompany the battle! Elements of 51st Highland and 3rd Canadian Division have pushed into the Northern suburbs of Caen. Units of both 12th SS Panzer and 21st Panzer Divisions have stemmed the Allied thrust into the city routed one Canadian Company. 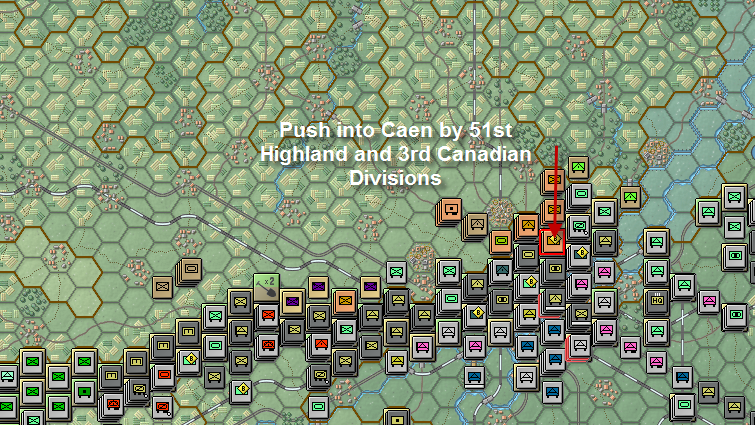 Caen itself is being put under tremendous pressure from the North as a combined arms assault is being launched by the British and the Canadians. AOK 7 has given the defence of Caen the highest priority as it is crucial to the strategic defence of the whole Normandy front. 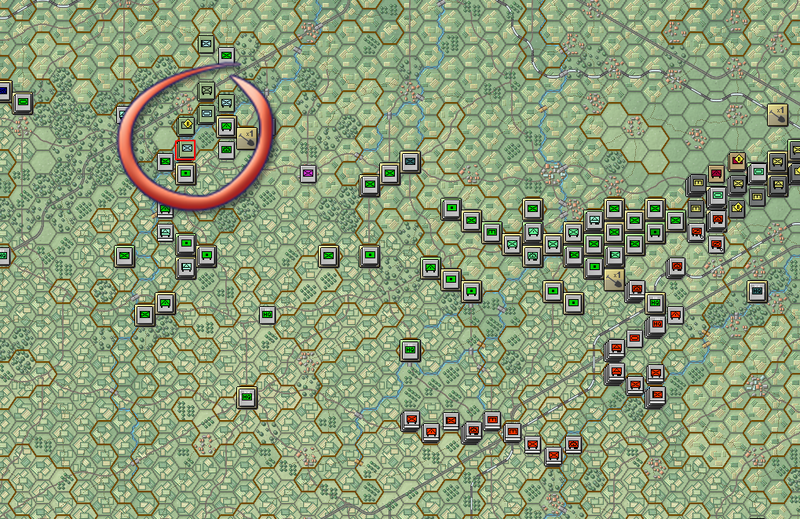 Elements of SS Panzer Grenadier Regiment 26 have been detached from front holding against the British Airborne and have been ordered into the Caen area around Herouville to assist in the defence. Reinforcements have once again been asked for. Allied force have engaged our line at various points. Gradual pressure to the North of Caen has meant that our line now lies on the formidable defences on the Northern suburbs of the city. They have, however, been stopped cold due to the massive support of the artillery units on the other side of the Orne and the mobile artillery of the 21st Panzer Division shuttling around Caen to keep the allied air forces guessing where the next deployment would be. On the other side of the theatre Allied para units have been stuck fast in the bocage so characteristic of Normandy. The support given by the heavy weapons platoons has been invaluable. 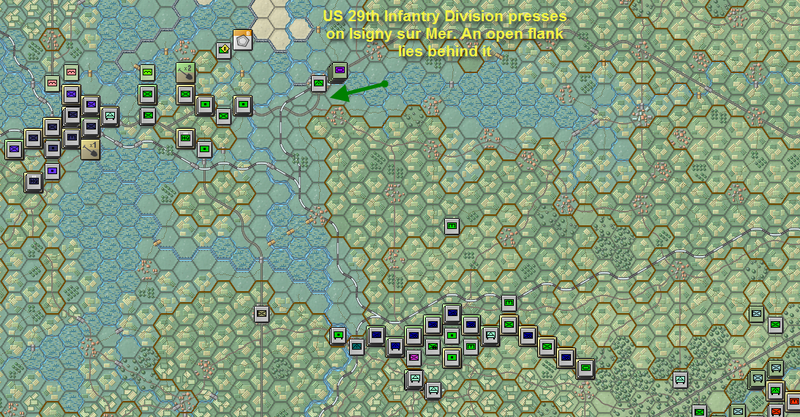 Unfortunately the US 29th Division has been exerting great pressure on the area of Isigny sur Mer. 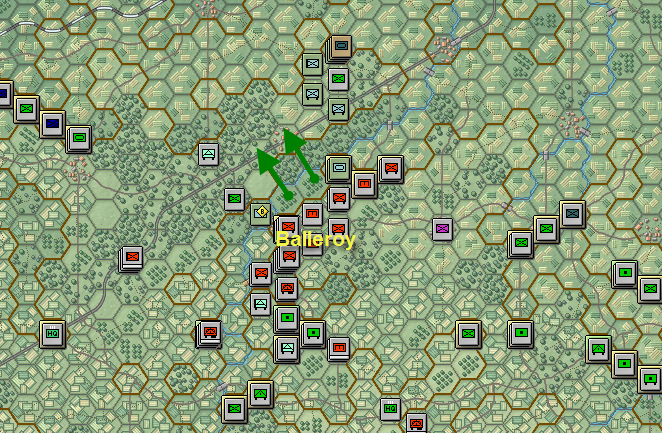 There is a great open flank behind this position and AOK is demanding reinforcements for this area. Urgent message was received by 84th Army Korps sent by 8./G.R.916 stationed at Balleroy. It reported being under heavy attack by elements of 1st US Division. It had repulsed two attacks at company strength but only did so due to heavy artillery support, something the Americans were sure to counter. Reinforcements were urgently being requested. Elements of Panzer Lehr Division were on their way to plug the gap between the Schnelle Brigade 30 and the 352nd Infanterie Division.